AVON, Ohio -- Bunkers, bunkers, everywhere. After playing Red Tail Golf Club in Avon, you'll be seeing bunkers in your sleep. Your mother-in-law will be standing at the top of a particularly deep one, shoveling sand down on you and chanting, "You shouldn't have missed the green, you shouldn't have missed the green!" Bob Buck, the semi-private club's general manager, doesn't dispute that architect Robert von Hagge might have gone a little overboard with the sand traps. They give fits to golfers at his other well-known courses like the Blue Monster Course at Doral Golf Resort and Spa in Miami, Gleneagles Country Club in Dallas, and the PGA National Golf Course in Palm Beach Gardens, Florida. But he says that doesn't mean the course can't be had by high handicappers. "On every hole, there is a risk-reward proposition," Buck says. Like on No. 5, a 155-yard par-3 with a beautifully stonewalled green. Water runs down the left side and swerves in front of the green. You can either take a pin tucked on the left-hand side dead-on and risk drowning your ball or bail out right. Or No. 15, a 450-yard par-5 that dares you to go for the small green that sits perilously close to water or lay up to the right like a good little boy. But then there are also holes like No. 17, a 145-yard par-3 that forces you to carry water. The green has two tiers, and when the pin is in the back, you're advised to play for the middle as the water also stretches behind the green. While the greens are fast, they don't give you the feeling that there should be a clown somewhere on them with his mouth open. Rarely will you come across a putt that turns harder than a race car in the movie, The Fast and the Furious. "The greens reflect the new version of the USGA specs," Buck says. "There is some undulation, but they're not tricked up. If you see the line and read the line, they will putt true." But those bunkers. There are 72 total, 36 on each nine. If you find yourself raking so many that you start feeling like a member of the grounds crew, step out and take a look around the course for a respite. What von Hagge did to this formerly flat 400-acre farmland makes you want to give a big hug to a greasy Caterpillar excavator. A signature of von Hagge courses, mounds are everywhere. While they provide for some crazy lies, viewing the shadows they cast in the setting sun make the pain worth it. If you're a sucker for great architectural design, check out the luxury pads that ring this course. The Red Tail golf community consists of homes from $350,000 to $500,000, some well in the range of a wayward ball. On some holes, you must cross over one of the development's roads to get from green to tee. When you do, you'll see why it's called a community -- residents pushing their babies in strollers or walking their dog or kibitzing will offer a friendly wave. And it ain't called Red Tail for nuthin' -- the natural beauty of Red Tail is enhanced by an occasional sighting of red tail hawks, which make their nests in trees surrounding the fairways. 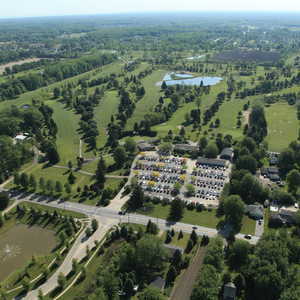 The Northern Ohio Golf Association thought highly enough of Red Tail to make it a qualifying site for the 2002 U.S. Open. The reason, says head professional Bryan Huff, was obvious. "Our course is a championship caliber course," he says. But golf aside, Huff says there's so much more that golfers can get out of visiting Red Tail. They need to get it soon, though, as the club has 80 percent of their membership goal achieved. "We have 225 members right now, and someday soon it will be private," Huff says. 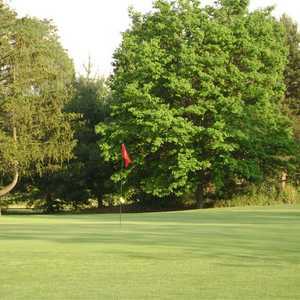 "Until then, the public golfer can have the private club experience without paying an initiation fee or dues. 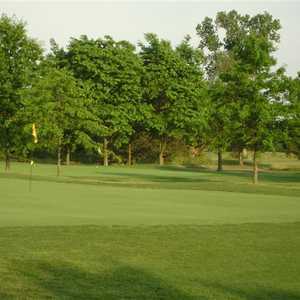 That includes excellent dining and playing a championship golf course that has private club conditions." That's too bad. Because when you miss a putt, you won't be able to blame a mystery fungus or a minefield of unattended ball marks. Take I-90 to Crocker Rd. exit (No. 156). Take Crocker Rd. south to Detroit Rd. Turn right on Detroit Rd. and travel about three miles to Lear Nagle Rd. Turn left on Lear Nagle Rd. Red Tail will be about two miles down on the right side.